Pirates and the newly opened New Orleans Square would be a swashbuckling success. 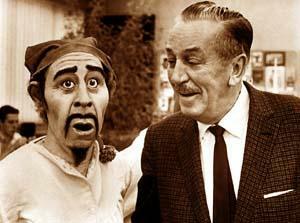 The audio-animatronics techniques used in Pirates of the Caribbean were first introduced and developed in the 1950s by Walt Disney and his staff at Walt Disney Imagineering (formerly known as WED Enterprises). It was also in the late 1950s that Disney introduced the concept of a pirate adventure that would use this newly envisioned form of 3-D animation. Before the art of audio-animatronics could be perfected, and with Disney’s vision being decades ahead of the technology available, several ideas for a pirate adventure were drawn up, including a walk-through Rogues Gallery wax museum. audio-animatronics medium. The more polished and fluid electronic-pneumatic movements used by the birds, flowers, and Tiki gods in the Enchanted Tiki Room would provide the basis and the backbone for those cut throat scurvy knaves on the Pirates of the Caribbean. Today, the residents of the plundered Caribbean port, 75 pirates and villagers, in addition to 53 animals and birds, are all brought to life by the technology first envisioned by Walt Disney and created by his team of Imagineers. Since its opening in 1967, Pirates of the Caribbean has been periodically refurbished and upgraded to reflect the very latest in technology to achieve increasingly life-like motions and more realistic expressions for the audio-animatronics figures. Other improvements have included new scenes, new computerized ride-control and water-control systems, and enhanced special effects, sound and lighting. With two cascading waterfalls, boats of adventurous guests are taken into the cavernous world of the Pirates of the Caribbean. Along the journey, hidden treasures are found, a ghostly shipwreck appears in the eye of a hurricane, and the haunted caverns open to a harbor port under siege. Sailing directly between a battling ship and Caribbean fortress, guests dodge cannonballs exploding just feet from the safety of their boats. The drunken antics of those jolly swashbucklers fill the town as a treasure-hunting pirate dunks the local magistrate in a well. Guests glide into the tunnels beneath the town where imprisoned pirates are locked in their subterranean cells. One of the towns dogs, holding the key to free them, pauses at pirates pleas, but not even a tasty bone will lure him to help. Chaos reigns as the town arsenal, full of powder kegs, burns furiously. Drunken pirates sitting atop the arsenal use the kegs, which they think are filled with rum, as target practice. Narrowly escaping complete havoc, guests retreat the only way out…straight up a waterfall. Over the years, the adventurous antics of the Disneyland pirates have become world famous. With pirate attractions also in the Magic Kingdom of Walt Disney World, Tokyo Disneyland and Disneyland Paris, it can now be said that nowhere in the world will the sun ever set on the pillaging antics of the Pirates of the Caribbean. Since its debut at Disneyland in California in 1967 the rollicking fun of Walt Disneys Pirates of the Caribbean adventure has thrilled guests from around the world. It is an immersive and engaging entertainment experience steeped in detail. Here are just a few of the fun facts and trivia associated with one of Walt Disneys greatest entertainment achievements. 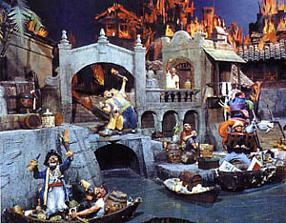 The attraction was originally envisioned as a New Orleans-themed Blue Bayou Mart featuring a Pirate Wax Museum, housed in a 70-foot deep basement. The basement now serves as the grotto section of the attraction. Pirates of the Caribbean was loosely inspired by such Hollywood films as Captain Blood, The Sea Hawk and The Buccaneer, plus Disneys Treasure Island and Swiss Family Robinson. The fire effects in the BurningTown scene were so realistic that prior to the attractions grand opening the Anaheim Fire Chief asked that the effects automatically shut off in the event of a real fire. The attraction opened to the public at Disneyland on March 18, 1967, with an official grand opening on April 19.
the site where the Louisiana Purchase was signed in 1803. >The attraction is housed within two large show buildings totaling 112,826 feet and featuring 750,000 gallons of water that flow through a 1,838-foot canal. Disney Imagineer X Atencio, who wrote the attractions memorable title tune Yo-Ho (A Pirates Life for Me), is the voice of the Jolly Roger skull and crossbones before you plunge down the waterfalls. the movie is inspiring the attraction. Pirates of the Caribbean, the classic Disney theme park adventure brought to the big screen in Pirates of the Caribbean: The Curse of the Black Pearl, is adding new characters and features from the blockbuster entertainment franchise and debuting when the next adventure begins in Pirates of the Caribbean: Dead Man’s Chest. Both the Disneyland Resort in California and Walt Disney World Resort in Florida will close the attraction in March to complete the updates in time for the opening of Pirates of the Caribbean: Dead Man’s Chest on July 7. The attraction will re-open at Disneyland on June 24 and in Florida’s Magic Kingdom on July 7. The attraction will feature the addition of two of Hollywood’s most infamous buccaneers, Captain Jack Sparrow and his nemesis Barbossa. Joining the wildest crew that ever sacked the Spanish Main, Captain Jack and Barbossa add an exciting new twist to the attraction’s original storyline as they race to be the first to claim a cache of plundered treasure. Successfully adding the popular characters from the ‘Pirates of the Caribbean’ films with the mythology of our classic attraction is an example of Disney synergy and Walt Disney Imagineering at its finest, said Jay Rasulo, chairman of Walt Disney Parks and Resorts. These additions will result in an exciting new chapter for the attraction and an unforgettable experience for our guests, giving them another reason to come and be a part of our continuing 50th anniversary celebration. Woven into some of the attraction’s most memorable scenes, the rival swashbucklers will be seen interacting with some of the more familiar Audio-Animatronics buccaneers found inside the ride-thru adventure. Also making a guest appearance is the ghostly Davy Jones from the second movie in the series, Pirates of the Caribbean: Dead Man’s Chest. But new characters are only the beginning. New special effects will also be added to enhance the Pirates of the Caribbean theme park experience. and then into a colonial era Caribbean seaport under siege by a band of fun-loving pirates. The attraction’s jaunty theme song, Yo Ho (A Pirate’s Life for Me), sets the show’s light tone with its tongue-in-cheek depiction of high-seas lawlessness. The original incarnation of Pirates of the Caribbean premiered on March 18, 1967, in New Orleans Square at Disneyland in California.